We take special pride tackling challenges that leave others scratching their heads. We have proven time and again that we can do it if anyone can. While our specialty is working with mild steel, our projects often include stainless steel, aluminum and even wood. Our shop is well equipped with brake, shear, iron worker, plasma cutter, 60 ft drill line and a variety of welding. We employ fabricators who are well rounded craftsmen skilled at working independently from engineering drawings. Detailed shop drawings are generated in-house using the latest CAD tools. Field installers have the diverse skills required to erect our work including cutting, welding, chemical anchoring and field fabricating as required. They arrive on-site with the full complememt of tools necessary to get the job done. Check out some examples of our bigger projects below. 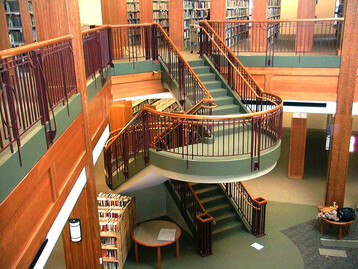 The 32,000 square foot Levi Heywood Memorial Library in Gardner, MA, completed in 2004, provides a facility to consolidate historical records which include the archives of the Heywood-Wakefield Co, a pre-eminent furniture manufacturer located in Gardner. The original library building it replaces, opened in 1885, is now a museum of Gardner's history. The two-story building is a steel frame structure with an exterior masonry façade constructed by NETCO Construction Project Managers, Inc. Mill City Iron Fabricators was chosen for their ability to fabricate the complex curved railings required. Memorial Hall, immediately north of Harvard Yard in Cambridge, MA, is an imposing High Victorian Gothic building honor­ing the sacrifices made by Harvard men in defense of the Union during the American Civil War. The tower, completed in 1877, soared an impressive one hundred ninety five feet. In 1956, the top portion of the tower was lost in a fire that was reportedly ignited by a welder's torch during maintenance. 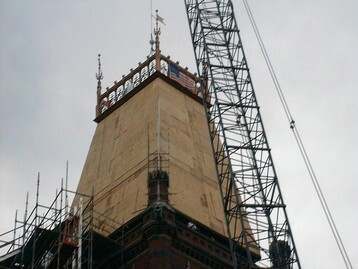 Gifts from Katherine B. Loker and other friends of the University facilitated the reconstruction of the tower in 1999. Mill City Iron Fabricators was engaged to fabricate and erect the structure. Brothers Field, longtime home of Phillips Academy varsity teams, was renewed and improved with the construction of Phelps Stadium, dedicated in 2002. 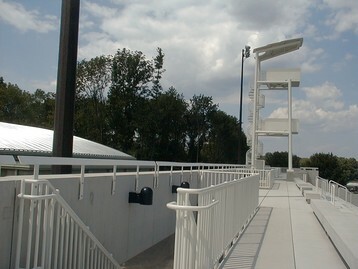 Phelps Stadium is a lighted facility with seating for over 2000 spectators and is handicapped accessible. Mill City Iron Fabricators supplied the observation tower for officials and press corps, along with miscellaneous railings, stair pans, security gates and bike racks.